“Ready by Design: A College and Career Ready Agenda for California,” published by Education Sector, recommends that the API shift focus from students’ performance on standardized tests to measures of readiness for college and careers, such as high school graduation rates, results of Advanced Placement tests, and percentages of students needing remediation in college. That’s essentially what Steinberg’s bill, SB 1458, would do without specifying what measures would be included, and that is what his bill last year, SB 547, would have done, had Gov. Jerry Brown not vetoed it with a snarky message sharply critical of quantitative gauges of school achievement. The report concluded that additional measures would not be a panacea, “but an outcomes-oriented API would at least measure and reinforce what’s most important: graduating students from high school with the knowledge and skills to succeed in higher education and a career,” wrote co-authors Anne Hyslop, a policy analyst with Education Sector, and Bill Tucker, deputy director, policy development at the Bill & Melinda Gates Foundation. The report was funded by the James Irvine Foundation, a big promoter and funder of an initiative to combine college readiness and career technical education, called linked learning. This is the second report from Ed Sector in a month on the California API. Last week, I wrote about “Academic Growth over Time,” in which author Richard Lee Colvin, a former executive director of Ed Sector, recommends Los Angeles Unified’s alternative way to calculate student results on standardized tests. The reports need not be mutually exclusive; recommendations from both could be combined. When establishing the three-digit API index in 1999, the Legislature implied that it would be adding a range of measures, but never did. Instead, the API is based on California Standards Tests results, primarily English language arts and math, plus results on the high school exit exam, which are not indicators of preparation for life beyond high school. But by adopting Common Core standards two years ago, the state embraced the goal of aligning high school achievement with college and career expectations. The API needs to change to reflect this, the Ed Sector report says. While college acceptance rates are indicators of readiness, the report recommends adding evidence of post-high school achievement to the API, such as college remediation rates, percentage of students who return to college after one year, and the percentage of students who enter the military or who go straight to work after high school. Unlike states like Florida, which track students after high school, California has incomplete, voluntarily collected data – hence the criticism of Brown for forgoing chances for federal database money. 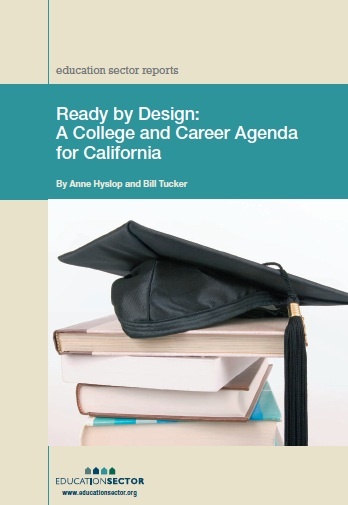 California does have one measure of readiness that other states consider a model: the Early Assessment Program, a series of questions created by the California State University and administered as a supplement to CSTs taken by high school juniors. But the authors said that “while touted as a model for those developing Common Core assessments, its respect outshines its influence.” The University of California and most community colleges don’t use results of EAP, and most high schools aren’t using the followup courses in math and expository writing that would enable high school seniors to bypass remediation in college. Quoting a 2006 survey that found 10 percent of high school teachers said their students graduated not ready for college, compared with 44 percent of college faculty who said students arrived unprepared, the report cited “mismatched expectations on both sides.” Including college readiness measures in the API would encourage high schools, colleges and business leaders to work closer to create common expectations and share expertise and knowledge. The report cited promising examples: collaboration between a San Diego high school and the Grossmont-Cuyamaca Community College District to redesign high school English courses; and the extensive agreements between Long Beach Unified and the local community college and CSU, Long Beach. “The Administration is fine with the API the way it is. I disagree and want to limit the importance of testing,” he said. The bill, which has passed the Senate, will be heard in the Assembly Education Committee on June 27. Steinberg said he hoped to negotiate with Brown on the measures in the bill. It includes the possibility of including school inspections, which Brown raised in his veto message and mentioned in his State of the State message in January. California’s Early Assessment Program and affiliated efforts to get students college-ready are viewed in national education circles as a rare achievement, a model of K-12 and higher ed collaboration. The recent naming of one of EAP’s key figures, California State University’s Beverly Young, to the Executive Committee of Smarter Balanced, the multistate group creating the Common Core assessment, is a sign that a new incarnation for EAP may be its ultimate triumph. EAP is what high school juniors take, as a supplement to their state standardized tests in math and English language arts, to determine if they are college-ready. For those who aren’t, CSU has developed an expository reading and writing course and is developing a course in math for students to take as seniors. A number of states have adopted the reading and writing course for their own students. an opportunity to correct deficiencies before they enter college,” said a report, “California’s Early Assessment Program: Its Effectiveness and Obstacles to Successful Program Implementation,” which was released this week. It was produced by PACE (Policy Analysis for California Education) and written by Hilary McLean, former communications director for the state Department of Education. California is a governing member of Smarter Balanced. CSU’s assistant vice chancellor of academic affairs, who’s been involved with EAP since its creation in 2004, will serve as one of two representatives of higher ed on the nine-member Executive Committee. PARCC – the other Common Core assessment consortium – has explicitly said it wants to base its college-readiness system on EAP, and has hired Allison Jones, a former CSU administrator in charge of EAP, to lead its effort. Even in California, EAP is not universally accepted. The University of California has steered clear of it, even though a quarter of its students systemwide need remediation classes in English (UCs don’t label their catch-up classes as remediation, but that’s what they are). And only about half of the state’s 112 community colleges accept EAP as a test for determining whether students are ready for credit-bearing courses. CSU has invested a lot in EAP. On its dime, it developed the test and pays faculty to grade the 45-minute writing portion of it. It created the writing course and online math and English tutorials. It hired regional EAP coordinators to work with high schools and has trained more than 6,000 high school teachers to lead the writing course. Still, respect for EAP probably exceeds its impact within California. It’s been a struggle to get students to understand what EAP is and to act on the results. Only 400 of the more than 1,000 high schools in the state offer the year-long expository writing and reading course, Young said. Participation in EAP has steadily increased to more than 80 percent in English Language Arts. Source: California's Early Assessment Program (Click to enlarge). Though voluntary, more than 80 percent of juniors now take the English piece, and nearly 40 percent take the math; fewer take the latter because they have to be enrolled in Algebra II as a junior, because CSU requires three years of math for admission. The test consists of 15 multiple-choice math and English questions, plus the writing piece. If, as promised, Smarter Balanced’s assessment incorporates more complex short-answer questions and is computer-adaptive, posing questions based on the student’s previous answers, it could improve on EAP. EAP was not intended to be a diagnostic tool, but it could provide more information, particularly for community colleges, on gaps in students’ math knowledge. “The end game now is how to go beyond EAP with the Smarter Balanced assessment,” said PACE Executive Director David Plank. CSU created EAP with the goal of reducing the number of students needing remediation to 10 percent of entering freshmen. That simply hasn’t happened. The percentage of juniors taking EAP deemed ready for college has edged up slightly to 15 percent in math and 21 percent in English. About two-thirds of entering CSU students still need remediation in either English or math, even though they have a 3.0 grade point average. Researchers estimate that EAP has cut the need for remediation by 6 percent in English and 4 percent in math. Students don’t understand the scores and what they mean; they assume, based on their grades, they are college-ready. There’s a disconnect: Most high school teachers assume their students are college-ready; far fewer college instructors agree. The picture may change soon. CSU campuses are adopting the policy that students must complete remediation courses before they arrive for school; that will encourage more to take expository writing and the new math course as high school seniors. Long Beach Unified, as part of its Long Beach Promise, requires students who don’t pass EAP to take the writing course. The year-long math course that Long Beach is piloting will go statewide this fall. Starting this fall, Young said, students who test proficient on their standardized English language arts test and take the year-long expository writing course with a C or better will be designated college-ready in English. Seven years ago, the California State University system developed a test in math and English language arts to help inform high school juniors whether they are on track to attend one of their campuses. The Early Assessment Program – EAP – has become a national model, and many high school students use the results in deciding whether to seek extra math and English help in their senior year. Now, the heads of the state community colleges and the University of California have gone on record in agreeing that EAP is a solid measure of college readiness. And they’ve pledged to promote its use among their potential students. While that may not seem like a big deal, it’s a strong signal that the state’s staunchly independent higher ed institutions plan to unite in more assertively working with K-12 schools to prepare students for graduation ­– not simply remediate them once they show up as freshmen.